The Cruzeiro was Brazilian money from 1942-86 and again from 1990-93. The name Cruzeiro refers to the constellation of the Southern Cross, a cultural iconic symbol in Brazilian history. During a period of high inflation Brazil money had a currency reform in 1994 and replaced the Cruzeiros with the Brazilian Real. The Cruzerio banknotes are long out of circulation and strictly collectible items. The 1992 Brazil 100,000 Cruzeiro was part of the 1990-93 series which were the last Cruzeiros printed. 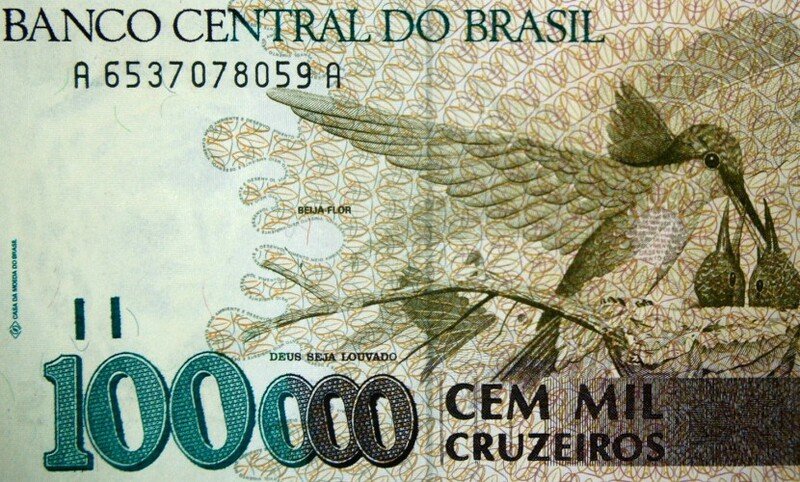 Only one year in printing the 1992 Brazil 100,000 Cruzeiros is a very rare inflationary note featuring a Hummingbird on the front. The 1992 Brazil 100,000 Cruzeiros “Hummingbird” bill is a collectible memory of Brazilian history in a portrait of a Hummingbird!